Fruits and vegetables need to be stored properly to ensure that the perishables do not go a waste. The racking system thereby needs to be capable of showcasing the produces in the right manner so as to catch the eye of the buyer. Since the turnover of these perishables need to be spot on, it becomes important to store them in such a manner that they gain prominence. Smaller veggies and fruits can be stored in adjustable fruit and vegetable racks that are concealed on three sides whereas for larger fruits and veggies like full pineapples, gourds, broccolis, etc., can be stored in plain and open adjustable fruits and vegetable racks. 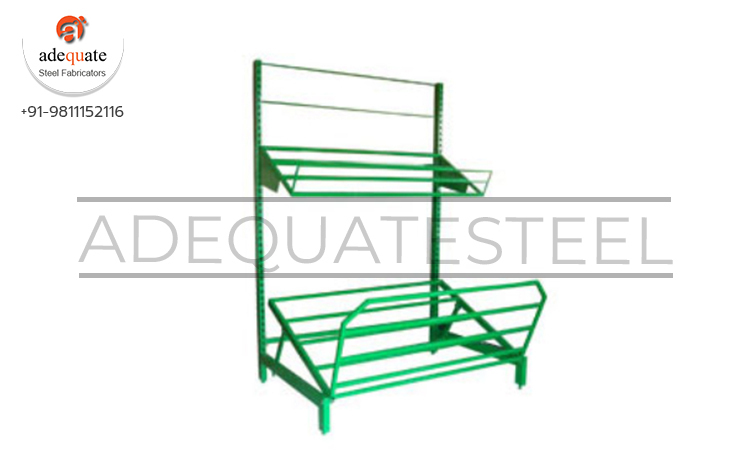 Adequate Steel offers these racks in two sizes at a common height of 1800 mm, length of 1200 mm and 900 mm and depth of 750 mm on the bottom rack and 600 mm on the top rack. It is also possible to store small sized veggies and fruits in trays and placed onto these larger racks. Hence these can be used for both small sized veggies and larger ones based on the need.